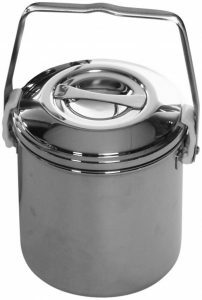 The Zebra Stainless Steel Loop Handle Pot, or Billy Can, is a useful piece of outdoor equipment ideal for stealth camping. Ray Mears and bush craft professionals have been using these cooking pots for well over a decade now, and are seldom found without them. If you’re going to buy just one piece of equipment for cooking in the outdoors, the Zebra stainless pot should be your first choice. Available in 4 different sizes (10cm, 12cm, 14cm & 16cm) this pot is great for boiling water or bush craft cooking.